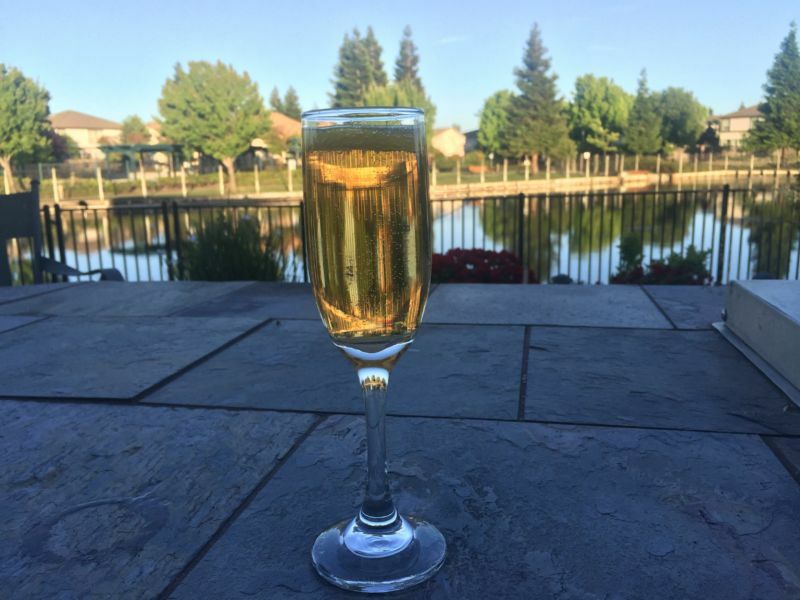 We recently wrote about our visit to Napa Valley Bistro and the Champagne Cocktail that I enjoyed. I have tried to re-create this drink at home. There were two significant deviations from the standard recipe for this cocktail; the omission of brandy and the addition of lemon peel. The impact of these changes was to make a light, crisp drink, which I can see adding to my collection of staples for home mixology. The bistro used Cava, a Spanish sparkling wine made using the same method as Champagne. Regular readers of this blog will know that we use a Cava as our regular sparkling wine of choice, so I used Cristilano as the main ingredient. My first attempt at the drink was darker than the drink in our photo from brunch and the Angostura bitters dominated ; clearly I had used too much of the bitters. The lemon peel ring at the top of the glass was not quite right, with a tail hanging down in the drink; this was fixed by removing it and pulling a few centimeters off so that the length of the peel was only slight greater than the circumference of the glass. One of the factors that motivated me to try reproducing this cocktail was the citrus notes that I tasted. I was sure that the presence of the lemon peel was not sufficient by itself to provide this flavour. I assumed that it would be necessary to squeeze or twist the peel; allowing drops of oil to fall into the drink. This technique goes by the fancy name of expressing the oils in cocktail parlance. I used about one-quarter of a teaspoon of white sugar, which looked right in the glass and the sweetness of all but the dregs of the drink was spot-on. My second attempt used a single dash in place of the original three. The drink still seemed a shade or two redder than my reference picture, but the flavor from the Angostura now felt about right. The third attempt using four drops, which is about half or two-thirds of a dash, looked a little pale but allowed the citrus from the lemon to shine. The drink now seemed to match the well-balanced example from the Napa Valley Bistro. Making the drink one more time by just dropping the peel into the glass validated my assumption that expressing the oil from the peel was a necessary part of getting the right balance. 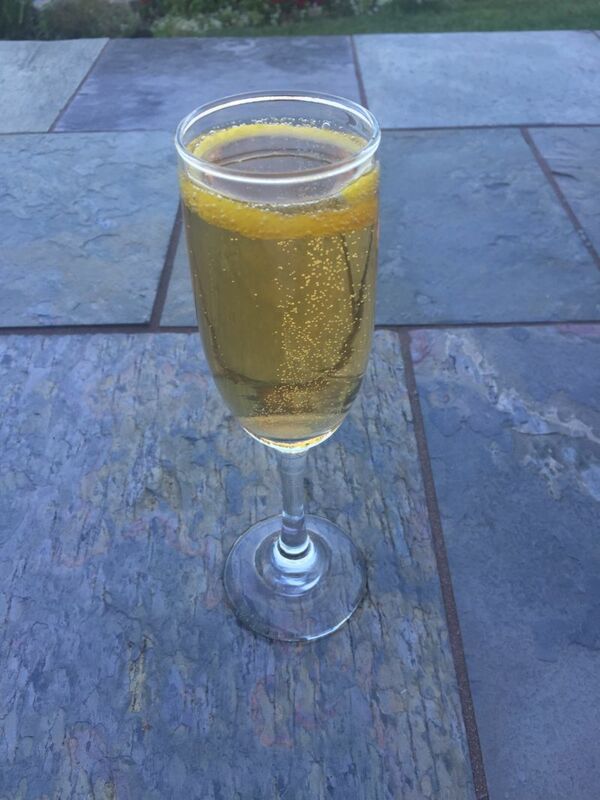 Put one-quarter of a teaspoon of sugar in the bottom of a champagne glass. Place four drops of Angostura bitters on to the sugar, trying to avoid splashing the side of the glass.